50-500mm F4.5-6.3 APO DG OS HSM Lens for Nikon F-Mount cameras. 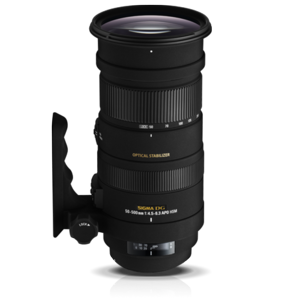 Great superzoom telephoto that works with any autofocus Nikon camera: film or digital. This is the perfect lens for outdoor sports, especially with kids, as the 500mm long end will let you get in tight for closeups while the 50mm wide end lets you shoot when the players are close by. The HSM designation means it contains an in-lens motor so it will focus on cameras (such as the D40, D60, D60x, D3000, D3100, D5000 and D5100) that do not have built-in focus motors. This is also the new style OS (Optical Stabilization) lens which gyroscopically stabilizes the lens elements, enabling you to hand-hold long-distance photos without blurring. This lens was purchased new in 2010 and is in absolute pristine condition. The optics are perfect. Includes tripod collar/mounting foot. If you plane on using this lens with a tripod you mount the tripod to the lens, not the camera. Also includes a lens case and cap.